Malic Acid, Maltodextrin, Natural & Artificial Flavors, Citric Acid, Silicon Dioxide, Red Beet Powder (for color), Sucralose, Acesulfame Potassium. As a dietary supplement, mix one (1) level scoop with 8 fl oz of water 15-20 minutes prior to workout. Do not take more than two (2) level scoops per 24-hour period. Do not take with any other products that contain caffeine or any other stimulants. CHECK WITH A QUALIFIED HEALTHCARE professional before using this product, or any dietary supplement, if you are under the age of 18 or if you have any known or suspected medical condition(s) and/or are taking any prescription or OTC medication(s) and/or if you are pregnant or nursing. Discontinue use two weeks prior to surgery. Discontinue use and consult your health care professional if you experience any reaction to this product. Contains caffeine. Too much caffeine may cause irritability, sleeplessness and occasional rapid heartbeat. To avoid sleeplessness, do not consume within 4 hours of bedtime. Always try to consume at least 64 fl oz of water daily while using this product. Do not consume more than two (2) level scoops per day. KEEP OUT OF REACH OF CHILDREN. ALLERGEN WARNING: This product was produced in a facility that may also process ingredients containing wheat, milk, eggs, soybeans, shellfish, fish, tree nuts. As a dietary supplement, begin with one (1) level scoop with 8 oz of water 30 minutes prior to workout for the first 2 days of use. Proceed with two (2) level scoops mixed with 16 oz of water thereafter. Adjust water to taste. For advanced athletes or those who desire the most intense workout, use three (3) level scoops with water adjusted to taste and dosage. Do not consume more than three (3) scoops per day. CHECK WITH A QUALIFIED HEALTHCARE professional before using this product, or any dietary supplement, if you are under the age of 18 or if you have any known or suspected medical condition(s) and/or are taking any prescription or OTC medication(s) and/or if you are pregnant or nursing. Discontinue use two weeks prior to surgery. Discontinue use and consult your health care professional if you experience any reaction to this product. Contains caffeine. Too much caffeine may cause irritability, sleeplessness and occasional rapid heartbeat. To avoid sleeplessness, do not consume within 4 hours of bedtime. Always try to consume at least 64 oz of water daily while using this product. Do not exceed recommended dosage. This product was produced in a facility that may also process ingredients containing wheat, milk, eggs, soybeans, shellfish, fish, tree nuts. Citric Acid, Malic Acid, Natural and Artificial Flavors, Silicone Dioxide, Maltodextrin, Sucralose, Red Beet Powder (for color), Acesulfame Potassium. This product was produced in a facility that may also process ingredients containing wheat. milk, eggs, soybeans, shellfish, fish, tree nuts and peanuts. Contains: Soy. Citric Acid, Waxy Maize Starch, Natural and Artificial Flavors, Silicon Dioxide, Sucralose, Purple Carrot Root Extract (For Color), Acesulfame Potassium. natural and artificial flavors, maltodextrin, calcium silicate, citric acid, waxy maize, sucralose, acesulfame potassium, FD&C red #40. As a dietary supplement, use 2 level scoops with 8 - 10 oz of water 30 min. prior to workout or any physical activity where increased energy and performance are desired. Check with a qualified healthcare professional before using this product, or any dietary supplement, if you are under the age of 18 or if you have any known or suspected medical condition(s) and/or are taking any prescription or OTC medication(s). Keep out of reach of children. Do not use if seal is broken. Contains caffeine. Too much caffeine may cause nervousness, irritability, sleeplessness, and, occasionally, rapid heartbeat. Citric Acid, Waxy Maize Starch, Silicon Dioxide, Natural & Artificial Flavors, Red Beet Juice Extract (for color), Sucralose, Acesulfame Potassium. The professional strength pre-workout formula designed to help you reach new levels of performance. In making the formulation more powerful, Beast Mode has been specially designed to ignite new muscle, maximize focus and intensity and provide the energy you need to power you through your workouts from the beginning to the end. 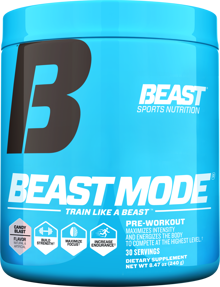 By utilizing the perfect blend of Glycerol, specific aminos, Beta-Alanine, Nootropics, NO2 boosters &more, Beast Mode helps your body increase mass , strength, intensity and focus. The potent dose of Glycerol assures mind-blowing pumps and maximum vascularity. Beta-Alanine and NO2 boosters maximize muscle performance so athletes—professional and otherwise—push harder to dominate their training or competition. The new Beast Mode also features Nelumbo Nucifera seed combined with natural caffeine as well as a full complex of B Vitamins including Thiamine (B1), Niacin (B3), Pyridoxine (B6), and Methylcobalamin (B12). These key ingredients provide a powerful punch to energize your workout without being over-stimmed. Beast Mode also amplifies both focus and concentration, keeping your mind sharp and focused as you train. Beast Mode benefits mood, releases stress, and boosts memory as it delivers nootropics including Choline, Tyrosine, Bacopa and Ginkgo. 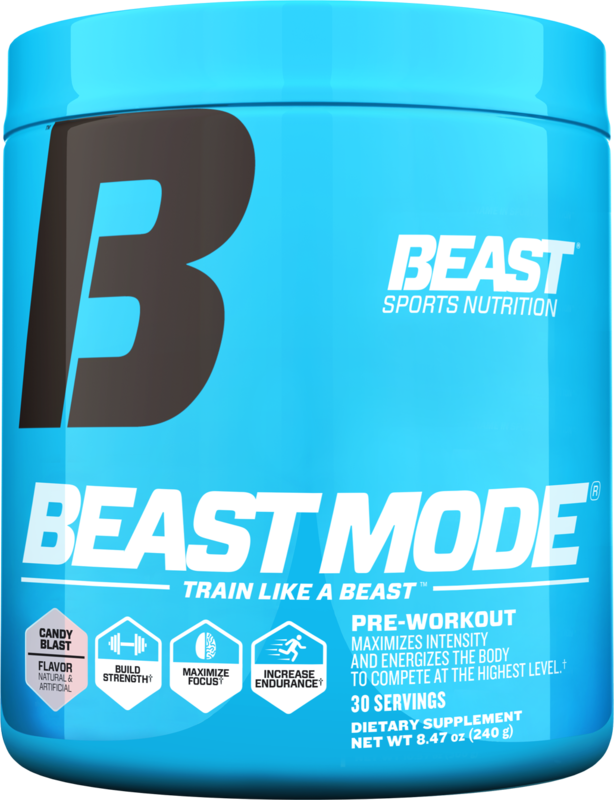 Turn to Beast Mode for energy to help your mind and body perform at its best and power you through your entire workout. The consistent, balanced levels of energy increase stamina without jitters or anxiety. Beast Mode is the latest in performance based pre-workouts delivering a clean balanced energy and powerful muscle building pumps. Available in our new Beast Punch and Pink Lemonade flavor. People can enjoy the convenience of the quick-dissolving and fast-acting powder designed for immediate results. • As a dietary supplement, use 1 level scoop 30 min. prior to workout or any physical activity where increased energy and performance are desired. • For a more intense workout use 2 level scoops, and for the most intense workout use 3 level scoops. For each scoop, mix with 6-8 oz of water. Do not consume more than 3 scoops per day.